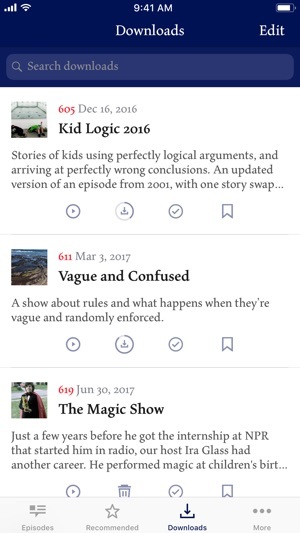 Official app for the public radio program This American Life, giving you access to the show's full archive. You can download an unlimited number of episodes for offline listening. 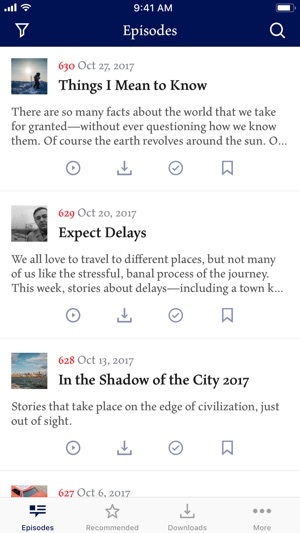 You can also bookmark episodes to listen to later, and track your progress through our archive by marking stories as heard. Browse and download episodes hand-picked by the show's host, Ira Glass, and our staff. Use our new search and filter functions to find your favorite stories by topic, contributor, and year. This American Life is produced in collaboration with WBEZ Chicago and delivered to stations by PRX The Public Radio Exchange. This app was developed by Black Pixel. Thanks to user feedback, this update includes basic CarPlay integration. It also has some minor bug fixes. Email us at web@thislife.org with any feedback or feature requests. So let me say I love This American Life. I chose to purchase this app because the sales pitch was: buy this app so that you can access the entire TAL archives. Then a week or two in to my purchase they locked out access to the archives. Not sure if it's a bug or not. There are 50-60 available still through staff favorites page etc. but that's not what was advertised. I see there is a live stream to listen to episodes randomly but it doesn't seem to connect. And if I'm going to listen while I have no cell service then I need to download ahead of time which I can't do with the live stream. So what's the deal? Fix the app and get it back to the original idea. Bottom line, I paid money to download the app so that i can listen to my selection from the archives and that doesn't work! They have redesigned the app and they are back on track. I just started using the new version but it seems to be everything that was promised. Way to go TAL! You heard the criticism and responded with a great update! I love that I can search episodes by different info. 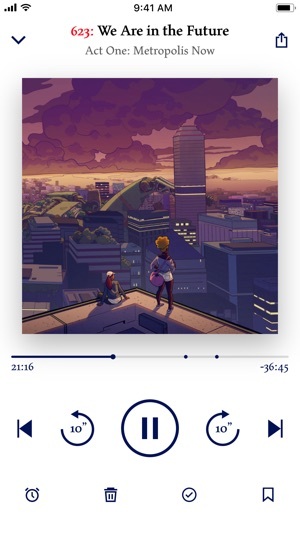 For example if my friend says, “hey I was listening to episode 432 and it so crazy!” I can go search ep 432 download and listen. Changing my review to 5 stars!!! Thanks for making a great product! Like everyone else here, I love the show, but I really hate this app. The old version certainly wasn't perfect, but at least it worked! 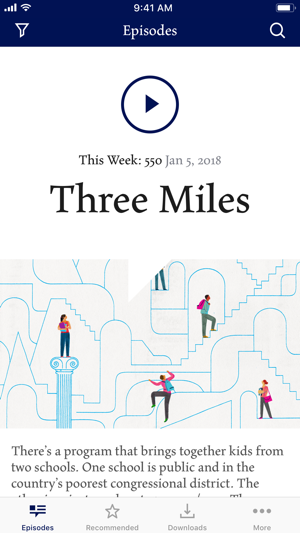 This app used to be the only thing that made my commute bearable...and now it's ruined! It takes forever to respond to commands, like play or pause, forward or rewind. Sometimes it just doesn't respond at all. All the episodes I marked as heard are now no longer marked as such. It's no longer possible to pause your listening, quit the app, and pick up where you left off. I really hope the devs are seeing these reviews! What could have possessed them to release this shoddy upgrade??!! Apparently TAL can't seem to find someone who knows how to write an app that works. The same head-bangingly frustrating problems exist after purported "bug fixes" in the latest update. But now there's an added bonus! Now some of the episodes won't play at all! You tap "Play," and nothing happens! Same thing when you tap "Download"—nothing, nada, zip! It's just so AWESOME! I would love to hear Ira address this problem on the show. He owes an apology to his listeners. Except, of course, we'd never be able to hear it unless we caught it on the radio. I've been reviewing some of the app reviews, & I am baffled on how many people are complaining that the app has 'bugs'. I haven't noticed any glitches, bugs, or anything of that sort. So, I am not sure if it depends upon the type of phone or devise you're using, but I listen to this app on both; iPhone7+ & my iPad. Both devices play my app w/out any issues, (used on both; WiFi &Data Plan). 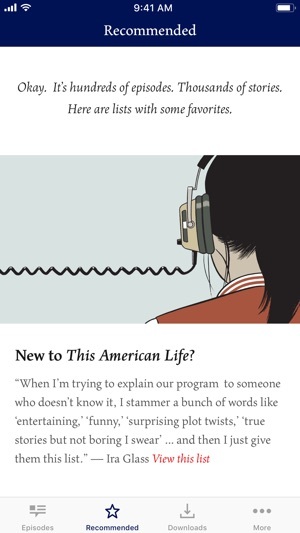 If you're new to 'THIS AMERICAN LIFE' - & contemplating on whether-or-not you want to spend the $1.99 or $2.99... well don't contemplate ... because I can promise you, you won't regret it!!! This app has been the only reason I have been able to make the loooong drives back & forth to Oregon (from CA). On a monthly basis. I LoVe LoVe LoVe this ApP!! I ❤️ Ira Glass!! !